These are notes from my popular Artfest 2001 workshop. Vinyl bag with at least one transparent side. Optional: beads and cord or floss, or small dimensional embellishments (see directions for ideas). Use a plain sheet of paper for your collage base/support. Otherwise, the back of your work will show through the other side of the vinyl bag. 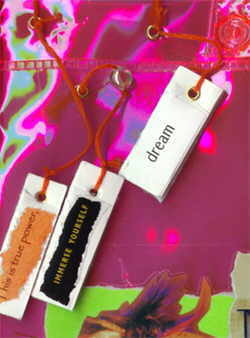 Create a collage using modpodge, gluestick, gloss medium or other adhesives. As long as it doesn’t pucker the paper, almost any glue will work. You can use charms, trinkets & raised elements, but they don’t stick well. Sorry. Hang them from the bag, instead. If you like, you can create two collages, one to go on top of the vinyl, and one to show through from the inside. You can even cut the vinyl so the inside one shows through better. Cut your laminating plastic to size. Trim closely, but allow at least a half inch around your collage, so the plastic will stick. I use shiny laminating plastic sold on a roll at A. C. Moore. A similar product at Michael’s is often matte, like Contac paper. I like the shiny stuff. Sometimes, you can find this at Staples or an office supply shop.You can also use 2″ wide packing tape, or any clear adhesive product that suits your mood and artistic vision. Next, place your collage, face down, on the laminating plastic. When you pick up the laminating plastic, the non-sticky side and the collage should be facing you. Stick the plastic-covered collage onto an appropriate place on the bag. – IF you like: Punch holes in the vinyl using a 1/8″ punch. Add tiny grommets/eyelets using the tool, hammer, and wood block. Tap lightly! – Attach more evidence at the bottom edge of the bag (only if you like). Grommets are not required here if you’re sewing something the width of the bag. Just go ahead and sew through the vinyl. If it rips later, use clear packing tape to repair it. – You may want to replace the handles with something better. For example, a strong measuring tape may make a great handle, or you could use braided ribbons, or…? – Use your tote, accept compliments, and make fresh tote bags regularly since these are easy, inexpensive, and fun!